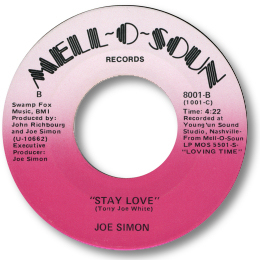 No question Joe Simon is the most underrated southern soul singer. Why? I think it’s because at first listen it all sounds so easy, so laid back. Never an “in –your-face” screamer, he achieved his emotional impact through a complete command of phrasing and dynamics, his rich dark velvet baritone voice simply oozed class and the subtlety of his approach worked on listeners like a slow flame. Simon had a beautiful dark velvet baritone voice which floated effortlessly over and around a tune. But if you pay close attention you’ll hear a master craftsman at work. I don’t know any singer who repays repeat listening so handsomely. 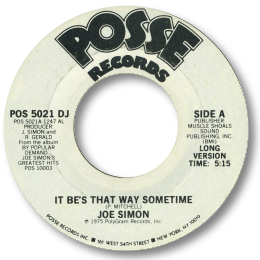 Every time I play a Joe Simon track I hear subtle shades of emphasis, nuances of timing, volume and diction that make the cut come up brand new. 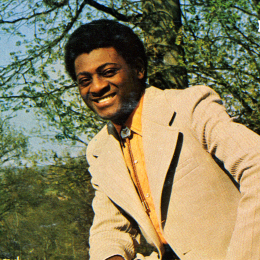 There is no space here to go through his whole career but enough to demonstrate why he deserved his great success in the business – over 30 years he scored almost 50 hits in a wide variety of styles from near doo-wop to disco. After early releases as a member of the Golden Tones, and as a solo artist for Hush, Gee Bee and Irral he cut several fine tracks for Vee Jay. My favourite is the Fame recorded ballad Let’s Do It Over which was one of the first of his wonderful country soul ballads. The way he glides through the verses and raises his game for the hook is a consummate object lesson in how to sing a song. His records for John Richbourg at Sound Stage 7 are a byword in excellence and should have a place in every soul fan's collection. Quite apart from the big hits, try “Woman Without Love” and “Silver Spoons And Coffee Cups” as examples of the quality of this period in Joe’s career but perhaps the best example is Straight Down To Heaven. Barney Hoskins rightly identified this beautifully realised waltz as one of the top 20 country soul performances. I think it's possible to make two generalisations about Simon's 70s work for Spring. The first is that the later the date of the recording the higher the chances are that the quality will be poor - and Joe will be lost in the disco excess. The second is that his best tracks were produced by John Richbourg, who continued to use studios in Nashville and Muscle Shoals, where the musicians were most sympathetic to the sound tboth he and Joe were after. Take the gorgeous "Georgia Blue" from "Simon Country" for example or the superbly structured "Sweet Memories" from "Easy To Love". The most consistent set was surely “Mood Heart And Soul”. Aside from such super tracks as “Walking Down Lonely Street” and “I Would Still Be There” it contained one stone five star killer ballad, I’m In The Mood For You. The playing of the MSS crew is just phenomenal – Roger Hawkins subtle touches, Barry Becket’s organ fills, Pete Carr’s beautifully judged licks and the understated horns are just perfect. And Simon responds with such a convincing vocal – stretching phrases and moaning gently. Perhaps the most obvious tracks to mention outside these southern recordings were his Philly ones - discs like “Drowning In The Sea Of Love” and “Pool Of Bad Luck” are quality mainstream soul. At the turn of the 80s Simon joined the Nashville Posse label, making a very welcome return to country soul. Cuts like “Magnolia”, the lively “Love Look At Us Now” and the delicate “Baby When Love Is In Your Heart” are simply magnificent. But the pick is the beautiful Glad You Came My Way. This classic had a super melody and Joe at his most introspective almost caresses the lyric. Such dynamic range and control. This return to form continued as he signed for Compleat in the mid-80s. “Morning Noon And Night” and “Let Me Have My Way With You”, despite the lack of sweetening, are amongst the best black music from that decade. 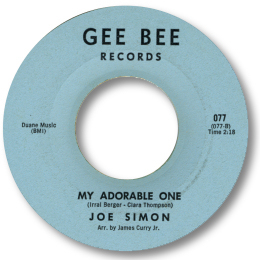 Simon’s last secular 45 found him back with Richbourg cutting the fine Tony Joe White penned "Alone At Last"/ “Stay Love” but JR passed away and Simon lost heart. These days Bishop Joe Simon leads his congregation in song, his glorious mellow voice still capable of sending shivers down your spine. Long may he continue to do so. Note:- Joe also appeared on Warner Bros LP 2719 "Cleopatra Jones" soundtrack.